Can you think of anything more important to Apple? The iPhone celebrated its tenth anniversary this week, and it’s hard to imagine where Apple would be today without it. It is by far the company’s most successful product, but is it also its most significant to date? Apple revolutionized a number of product industries with the Mac, iPod, iTunes, and iPad — all of which have been incredibly successful at some point. It also pioneered new concepts with products like the Newton. Were any of these things more important to Apple than iPhone? Join us in this week’s Friday Night Fight as we relive our first experiences with iPhone and discuss Apple’s most significant product releases. Killian Bell: I was 19 when the original iPhone made its debut. I was interested in it, but I wasn’t desperate to get one; I was happy with my Nokia N70. But I was walking through town one day and I saw a giant iPhone display in the window of an O2 store, demonstrating features like Mail and Safari. I had to go in and check one out. About 20 minutes later, I left the store with my first iPhone, and a massive dent in my bank balance. I wasn’t earning much at the time, and the original iPhone still cost a fortune in the U.K. even with a contract. But it was definitely money well-spent. I didn’t put that phone down for hours after I got home, and I’ve purchased every iPhone on launch day ever since. For me, this is one of the reasons why I think the iPhone is the most significant product Apple has ever made. I want to buy the latest model every single year — even if it only brings incremental improvements — because I want the best iPhone experience available. The iPhone didn’t brings Jobs back to Apple or save the company from bankruptcy. But it’s the product most fans think of first when they see the Apple logo. It also played a major part in making Apple the world’s most valuable company. It claimed that titled in 2010, three years after the iPhone made its debut, and its market cap still dwarfs every other company’s today. What’s your earliest memory of the iPhone, and do you agree it is Apple’s most significant product to date? Luke Dormehl: I was 22 when the iPhone first came out. I can’t remember what phone I was using at the time, but I’d had a series of flip-phones and remember that all of them had been terrible for using the internet. It was possible, but it was like pulling teeth. I watched the original keynote but the first time I saw an iPhone in person was when someone brought one into the office I was working in at the time. It’s difficult to stress just how different it looked to every phone that was out. Its lack of keyboard seemed crazy and even the idea of holding up a flat piece of glass to your ear looked like something out of Star Trek. I’ve never seen a similar reaction to a piece of technology from people around me, either: everyone was immediately fascinated by this thing. And with good reason. It didn’t take long after that before I was a proud iPhone user. With that said, would I consider it to be Apple’s most significant product? I don’t think it is. Now that’s not putting the iPhone down in any way. Apple has been responsible for some amazing pieces of tech over the years, and the iPhone is absolutely one of them. It’s also sold more than a billion units, which is a feat that Apple is unlikely to surpass with any other product. It has taken the company to new heights of profitability and it’s managed to stay relevant for a decade which, for a fast-moving and competitive field, is pretty astonishing. To say what Apple’s most significant product is, you’d probably have to ask “significant to whom?” For example, the iMac G3 was significant because it marked the first collaboration between Steve Jobs and Jony Ive. Without that product, who knows what else we might never have seen — since it’s the product which saved Apple and started a creative partnership that led to many, many more insanely great products. Even the Newton has a claim to being culturally significant — because it foreshadowed the transition to mobile devices which swept Silicon Valley later on in the decade. Personally, though, I’d go for the original Mac. No, it wasn’t an immediate success like the Apple II, but it redefined how a lot of people viewed personal computers. It made the GUI mainstream and, without it, a lot of the software that works so well on the iPhone wouldn’t be around. It’s also democratized tools that were previously not available to everyday consumers. You can argue about whether another company would have built the Mac had Apple not done so (under a different name, of course), but the effect it had on personal computers was astonishing. Killian: Yeah, everyone was wowed by the iPhone. I remember taking mine into the office I was working in soon after I got it, and when someone noticed I had one, I suddenly had a bunch of people crowding around me asking questions. I suddenly felt like a sales assistant in an Apple store. That was the only downside to owning one, I think. When I talk about the most significant product, I think of the one that’s had the biggest impact on Apple. I know you could argue that without earlier devices, Apple wouldn’t have been around to launch the iPhone. The products you’ve mentioned (with the exception of Newton) were certainly crucial to its success throughout the years. But the iPhone delivered so much more. Apple wouldn’t be the behemoth it is today without it. It’s not often we see one product line from a consumer technology company achieve what the iPhone has. Not only has it made Apple a staggering amount of cash, but it also paved the way for iPad and Apple Watch — two new lines that have also been incredibly successful. It completely changed mobile software, too. Sure, the Mac redefined personal computing, but the iPhone changed cellphones. Look at smartphones released before 2007 and they’re totally different. They all have physical keyboards and tiny displays, and software that was barely usable. You mention another company could have built the Mac, and I think that’s true. If Apple didn’t make the GUI mainstream, a rival would have. But I’m not sure another company could have made the iPhone. Luke: I think it’s inevitable that someone would have eventually — but I don’t think anyone was close to thinking along those lines in 2007; just like no-one was thinking about a Macintosh-type computer in 1984. There’s absolutely no disputing the financial success of the iPhone, but Apple had some spectacular quarters before that with the iPod. Just yesterday in my “Today in Apple history” post, I wrote about a 2005 quarter where the iPod had given Apple a fourfold increase in profits over a three-month period. That’s incredible! So it’s not like Apple hadn’t had big success before the iPhone, although the iPhone took things further. The reason I don’t think the iPhone was as culturally significant as the Mac is because I don’t think it gave customers access to tools they’d never had before. Sure, it changed cellphones and gave us a way to search the internet when we were out and about, but the real revolutionary change with cellphones was their 1990s rise to dominance and the fact that they let us communicate when we were outside the home. The iPhone didn’t do that — it just made it a better experience. On the other hand, the Mac gave users access to tools like desktop publishing which, while quaint today, was a revolution at the time. It brought so many productivity applications into people’s homes which simply hadn’t been there before. The impact of the personal computer was on a totally level to the impact of the smartphone, and the Mac played a key role in shaping how that unfolded. One place you could argue the smartphone changed things enormously was in the developing world, where it not only gave people their first cellphone, but in many cases their first computers too. As well as their first access to the internet, which is absolutely massive. But that’s not really a market Apple’s ever pursued due to it not wanting to make low end phones. Again, I’m not trying to diminish the iPhone on its tenth birthday — just pointing out that, just because the Mac is viewed as a secondary product today, doesn’t diminish how important it was. Killian: Well, someone was thinking about the GUI, because Xerox invented it. And I’m not disputing other products weren’t incredibly successful. The iPod is certainly up there with the best, but I don’t think it would have made Apple what it is today. The big difference between the two is that the iPhone made a product we all deem a necessity better than it ever was before. The iPod wasn’t a necessity, though it was certainly nice to have. I think you’re downplaying the iPhone somewhat. We might have had web browsing and apps on phones before that, but they were terrible. The iPhone and smartphones that were inspired by it made web browsing and email and so many other things so simple that many people stopped buying computers for simple tasks. PC sales probably wouldn’t be in the gutter today if it wasn’t for the fact that smartphones become so capable. I think we’ve both made good points here, but we’re clearly not going to agree. So let’s hand this over the readers now. Tell us your first experience with iPhone and what you believe to be Apple’s most significant product down in the comments. 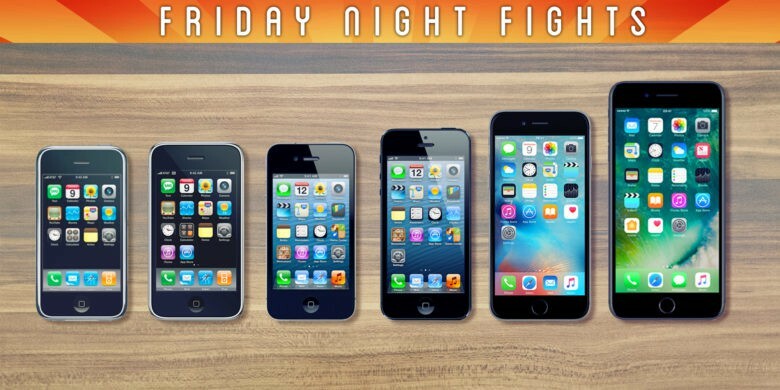 Friday Night Fights is a series of weekly death matches between two no-mercy brawlers who will fight to the death — or at least agree to disagree — about which is better: Apple or Google, iOS or Android?